The next stop on the Highway 101 road trip in May was in Crescent City, California. This little town with its rocky shoreline seems likely to see quite a bit of wildlife. 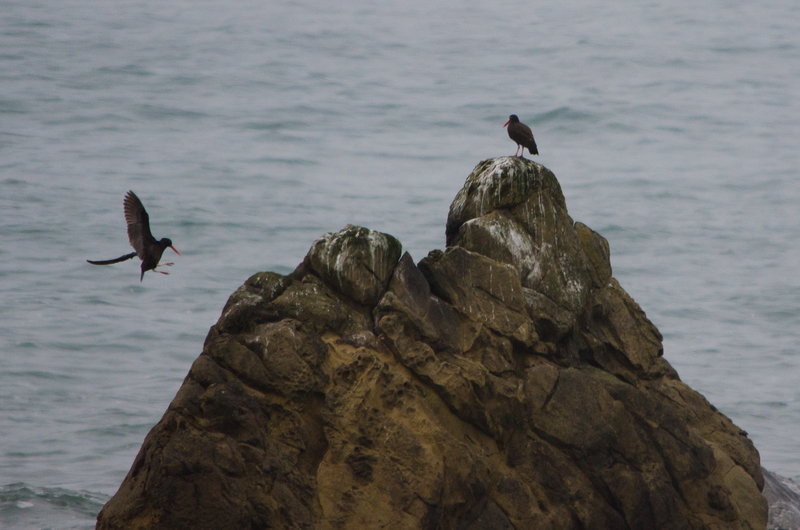 I spotted a variety of gulls (mostly Western, as far I was able to determine), pelagic cormorants, and black oystercatchers among the rocks, as well as a sea lion at rest. The trip moved quickly northward, through the well-known giant redwood trees, to the California-Oregon state border. A short layover at Harris Beach State Park was well worth the stop, as a little Bonaparte’s gull was spotted among the larger Western Gulls feeding along the shore. 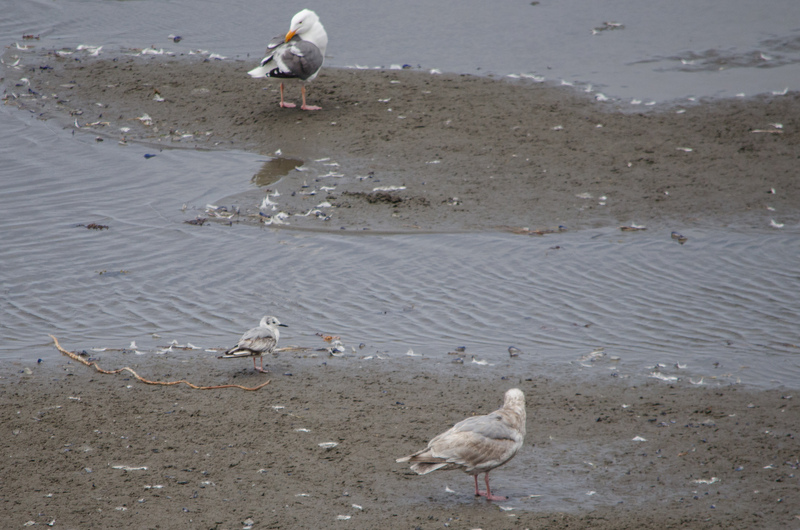 Although most of the gulls were resting on the beach or floating in a shallow pool left behind by the tide, a lucky few were finding meals among the rocks. 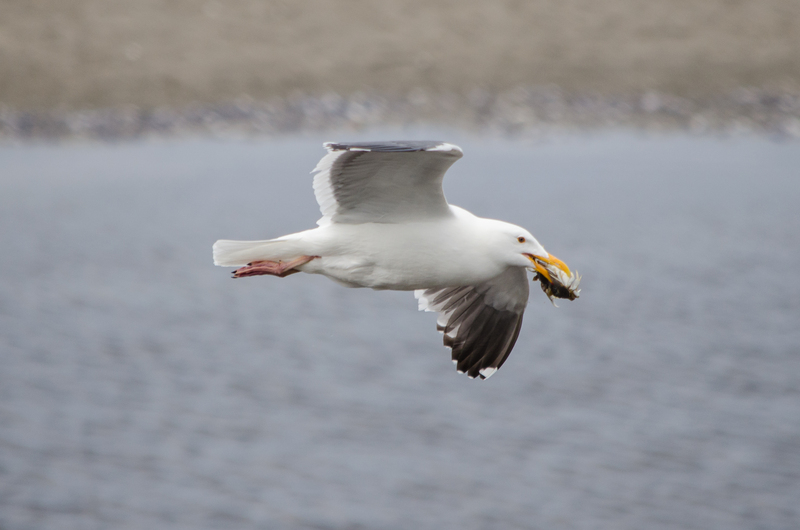 This one flew well away from the flocks with its crab dinner. 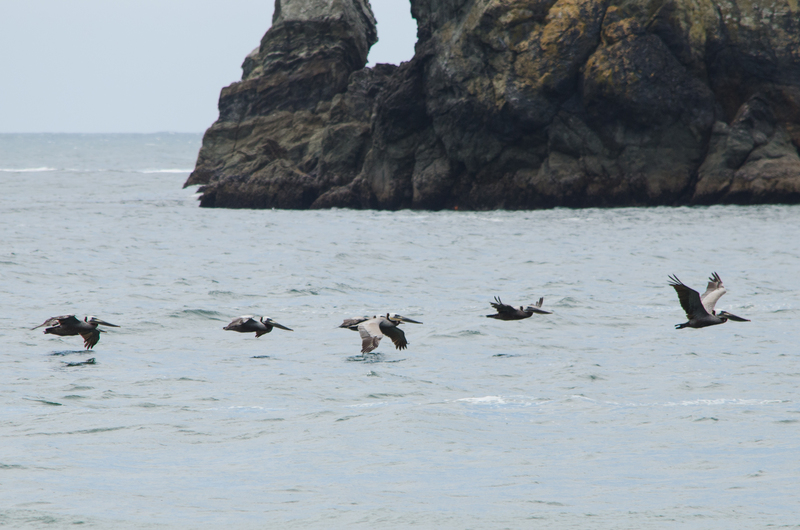 Out over the waves, flocks of brown pelicans moved north in stately lines like a game of “follow the leader”; when the lead pelican gained elevation, the rest of the flock followed upwards. When the leader came back nearer the ocean’s surface, the whole flock descended one at a time. It was almost as if they were on a track, and it was hypnotic to watch. Further out, a different, far less orderly flock of unfamiliar birds flew by. 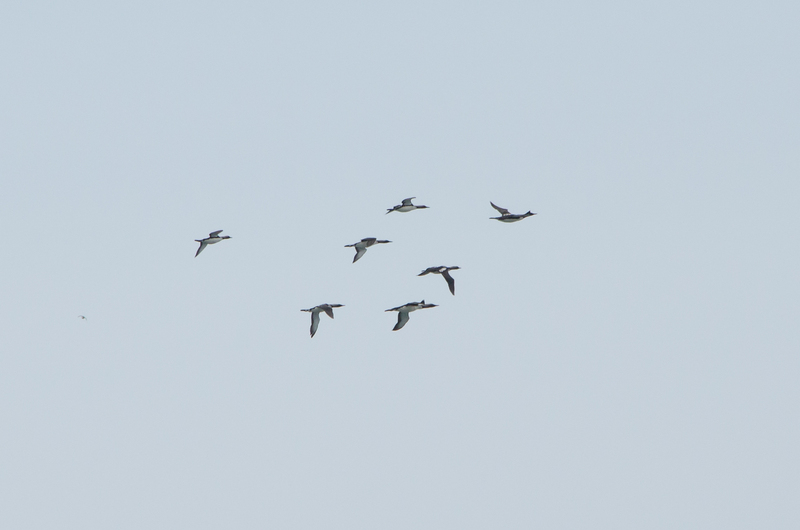 These long-necked birds flew in little clumps, with no apparent leader, spread out but all moving steadily north. 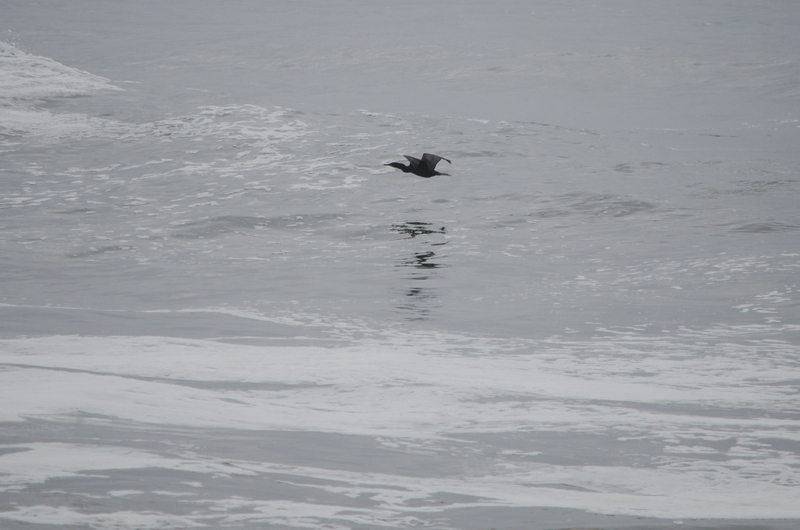 It took a closer inspection of the image to realize these were Pacific loons, a new bird for my life list! Getting ready to leave the park and continue my own northward journey, I heard a familiar and high-pitched cry. 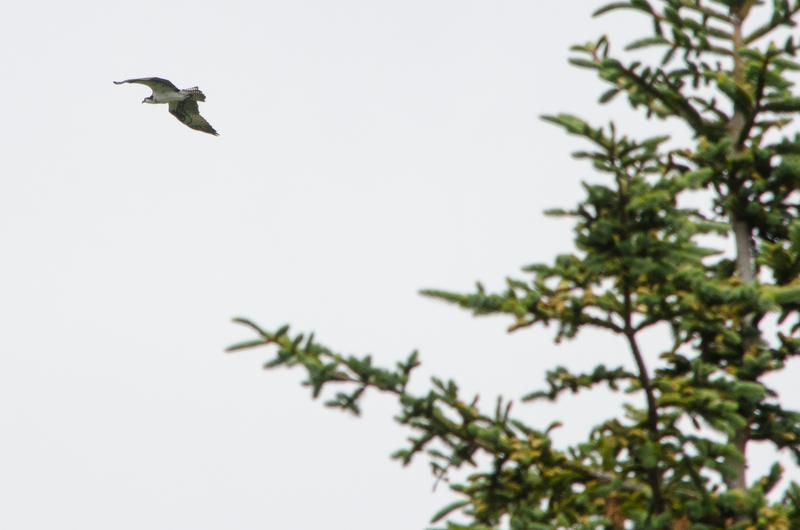 Watching above the treetops, I was rewarded with the first osprey I’d seen so far for the year. Also encountered in northern California and Southern Oregon were white crowned sparrow, American goldfinch, cedar waxwing, Canada geese, double-crested cormorant, song sparrow, great blue heron, and chestnut-backed chickadee.